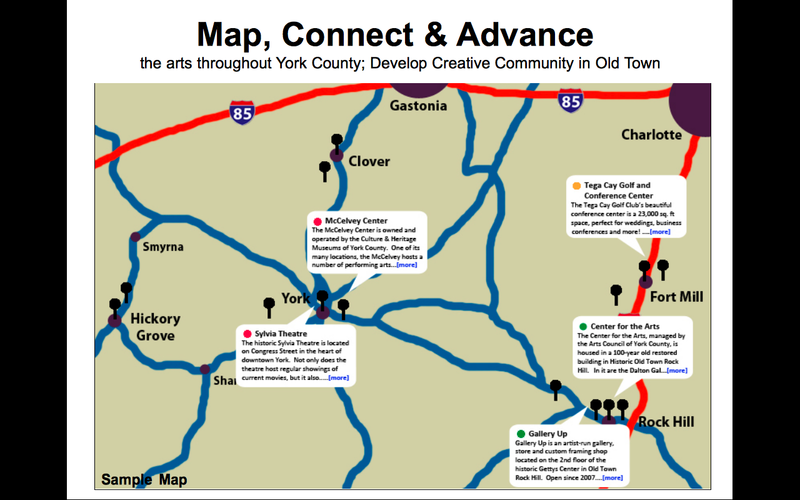 The Arts Council of York County (ACYC) is in a partnership with the City of Rock Hill and the RHEDC to plan and develop a “Creative Community in Old Town.” The ACYC is pursuing a $100k grant from one source and an $80k grant to extend efforts throughout the county. Develop a “Creative Community in Old Town” by increasing residential living spaces, creative work and studio spaces, business spaces, plus activities for the public, artists, and other “creatives.” Will include active recruitment/retention of artists and other “creatives” through support and incentives. Core partners, plus Social Design House, Gallery Up, Winthrop University College of Visual and Performing Arts, and selected local artists. May include others in Phase Two. Through residencies, exhibitions, performances, and arts education, and creative community engagement/outreach activities for the public in Old Town, Rock Hill, SC. The planning process will focus on how to “activate” some under-used or unoccupied spaces that will enhance four arts facilities. In the planned Old Town Arts Market/Arts Park and other venues in “Old Town” Rock Hill—namely, Center for the Arts, Gettys Arts Center, and the McFadden/Bass Apartments, adjacent to the Gettys Arts Center with some vacancies, which could be, used to house artists involved with community engagement initiatives. Bringing unused or underused spaces alive with creative activity will increase artists, “creative entrepreneurs”, and public participation in the arts, plus generate sustainable revenue, improve aesthetics, perceptions, and overall quality of life in Rock Hill. 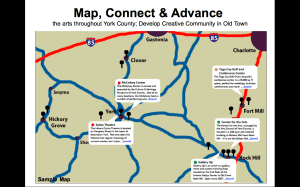 This plan may also serve as a model and catalyst for replicating these programs and services in other areas of York County (and beyond) that seek to focus on the arts and creative industries as a key element of their development plans. Share the post "Creative Community Grant in Old Town Rock Hill, SC"